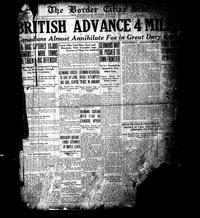 The Border Cities Star was a daily newspaper published in Windsor from September 3rd, 1918 until June 28th, 1935. It was founded when W. F. Herman and Hugh Graybiel purchased the existing daily newspaper: the Windsor Record (known as the Evening Record from 1890 until November 1917) from Mr. John A. McKay on August 6th, 1918. The acquisition was not without controversy. At this time, the Windsor Record only had partial wire service and so some felt that the national and international news was not covered as well as it might be. Originally, the Border Cities Star was intended to be a rival daily newspaper to the Windsor Record. However, Mr. Herman’s application to Canadian Press Limited for full wire service was denied because of opposition by Mr. McKay. Over the years, Mr. McKay had held a variety of committee executive positions at the organization. Mr. McKay then agreed to subscribe to the full wire service and sold the Windsor Record to Mr. Herman for an inflated price. This case became an example of what some felt was wrong with Canadian Press Limited. The wire service, which was subsidized by government funds, was run mainly by a group of publishers who could use it as a way of limiting competition and increasing the value of their own newspapers (Border Cities Era: October 18th, 1918, page 7). This said, W.F. Herman was actually an experienced newspaper man, having previously owned the Prince Albert Herald, the Saskatoon Capital (later the Saskatchewan Daily Star) and the Regina Evening Post. W. F. Herman became President and Hugh Graybiel was the Business Manager. They immediately changed the name of the Windsor Record to the Border Cities Star to reflect not only Windsor, but all the surrounding communities. In the newspaper's prospectus, published on page 4. of its inaugural issue, the new owners aim was to make it "a worth-while newspaper for worth-while people". They outlined two main goals: the first was to work with and build up local institutions and organizations. The newspaper "must endeavor to become one with its community, to enter closely into its daily life and being, and to voice for the community the otherwise largely inarticulate striving for the attainment of the largest self-development". The second goal was "to be worthy of Canada". They invoked Canadian pride and nationalism, in particular with regards to Canadians' contributions to the ongoing war, and stated their intention "to be broad, to be faithful, to be progressive and forward-looking, to be free and independent and unprejudiced. The Canadian who is not proud of our mighty country has no right or title to its citizenship." Nevertheless, the few specific issues that they mentioned are interesting: one was the revision of tariffs, and the second was to "uphold the English language as the only proper language and method of instruction in the primary grades of the public schools". This was a somewhat controversial stand, given the local blockade and riot over French-language education rights in 1917/1918. Originally, the Border Cities Star was published from the Record Printing Company offices at 36 Sandwich Street West, on the north side of Sandwich Street, just west of Ferry Street. In 1923, it moved to a building on Ferry Street, and in 1927, it expanded into adjacent, new, larger premises at the corner of Ferry Street and Pitt Street. When the city of Windsor annexed Walkerville, East Windsor (Ford City), Sandwich, and Ojibway in 1935, the Border Cities Star changed its name to the Windsor Daily Star. In 1959, it became simply, the Windsor Star.